Frederick French EURIDGE's estate was probated to Edith Maude WEBB on 18 December 1930 in London, London. [S3] GRO Indexes to Marriages "1935/Q2 Gravesend 2a 2273." [S3] GRO Indexes to Marriages "1915/Q2 Gravesend 2a 1738." [S89] World War I Records, PRO Kew WO 363, U032. [S2] GRO Indexes to Births "1930/Q2 Gravesend 2a 1261." [S212] Copy marriage certificate of Peter George Frederick Euridge and Alyson Barbara Hubbard (13 August 1968). [S4] GRO Indexes to Deaths "1995 Sutton 2541A A4B 116 0895 DOB: 14My1930." [S3] GRO Indexes to Marriages "1959/Q1 Dartford 5b 1070." [S3] GRO Indexes to Marriages "1979 Havering 130150." [S63] Letter from Alyson B. Euridge to Teresa Pask, dated 11 July 2000. [S2] GRO Indexes to Births "1878/Q4 St. Saviour 1d 100." [S1075] 1881 Census RG11 Piece 1387 Folio 20 Page 37. [S1076] 1891 Census RG12 Piece 2204 Folio 126 Page 31. [S1076] 1891 Census RG12 Piece 2202 Folio 27 Page 13. [S3] GRO Indexes to Marriages "1900/Q2 EURIDGE, Charlotte Annie = GIBBS, James Thomas West Bromwich 6b 1576." [S610] Sepia photograph of the Euridge Family. Kindly provided by Jane Ledger. [S6] Teresa Pask's Guesses, Theories and Speculation : Based on the names and strong resemblance to other photographs held. 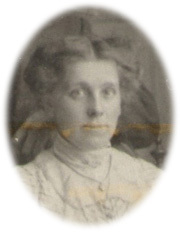 [S18] Information supplied by Elizabeth Emma Haynes née Euridge (Teresa Pask's Aunt Lizzie). [S3] GRO Indexes to Marriages "West Bromwich 6b 1576." 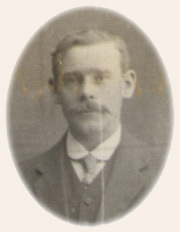 [S207] Copy birth certificate of William Harry Euridge (16 March 1880). [S263] Black and white photograph photograph of Euridge Family. 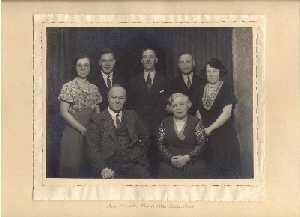 [S264] Black and white photograph photograph of Euridge Family. [S2] GRO Indexes to Births "1880/Q2 EURIDGE, William Harry St Saviour 1d 97." [S1056] Website Find My Past - 1939 Register (http://search.findmypast.co.uk/) RG101 5235E 007 Transcribed as CURIDGE. [S1077] 1901 Census RG13 Piece 2645 Folio 108 Page 33. [S3] GRO Indexes to Marriages "1901/Q4 EURIDGE, William Harry = HARPER, Emily Ann Burton 6b 762." [S1078] 1911 Census RG14PN27745 RG78PN1588 RD509 SD2 ED25 SN19. [S671] Copy birth certificate of Reginald Charles Euridge (9 September 1921). [S234] Teresa Pask's Research Notes 2000. [S11] Index to Wills, 1860 to 1989. [S11] Index to Wills, 1860 to 1989, Euridge, William Harry Buried: 31 Dec 1949 Stapenhill Cemetery, Staffordshire; Date of Death: 25 Dec 1949. [S954] Website Deceased Online (www.deceasedonline.com) Euridge, William Harry Buried: 31 Dec 1949 Stapenhill Cemetery, Staffordshire; Date of Death: 25 Dec 1949. [S11] Index to Wills, 1860 to 1989, William Harry EURIDGE of 45 Henry Street Burton-on-Trent Died 25 December 1949 at 145 Belvedere Road Burton-on-Trent Probate Nottingham to Emily Ann EURIDGE Effects £495 2s 9d. [S4] GRO Indexes to Deaths "1960/Q1 EURIDGE, Emily Ann Burton 9b 73 age 79." [S954] Website Deceased Online (www.deceasedonline.com) Euridge, Ann Emily Buried: 5 Feb 1960 Stapenhill Cemetery, Staffordshire; Date of Death: 01 Feb 1960. [S2] GRO Indexes to Births "1904/Q2 EURIDGE, John William Burton 1b 217." [S2] GRO Indexes to Births "1906/Q3 EURIDGE, Flora Mary Burton 6b 429." She was also known as Emma. [S2] GRO Indexes to Births "1880/Q1 HARPER, Emily Ann Burton 6b 411." [S2] GRO Indexes to Births "1921/4 EURIDGE, Reginald Charles HARPER Burton 6b 726." [S225] Black and white scanned photograph photograph of Paul Shand's christening. [S2] GRO Indexes to Births "1883/Q1 EURIDGE, Lizzie Louisa Edmonton 3a 308." [S1076] 1891 Census PRO Ref RG12/2204 3rd Fiche. [S4] GRO Indexes to Deaths "1971/Q3 ALLISON, Lizze Louisa 13 Ja 1883 Sheffield 2d 592." [S1076] 1891 Census PRO Ref: RG12/2204 3rd Fiche. [S3] GRO Indexes to Marriages "1907/Q1 Burton 6b 495." [S3] GRO Indexes to Marriages "1907/Q1 ALLISON, Henry James Burton 6b 495." [S899] Image of the 1911 census for 40 Toftwood Road, Sheffield, Yorkshire: RG14 Piece 27741 Schedule 363. [S4] GRO Indexes to Deaths "1947/Q4 ALLISON, Henry J. Sheffield 2d 317 age 66." [S604] E-mail from Jane Ledger to Teresa Pask dated 6 November 2004. Henry James's nickname was Harry. Research Note: Jane wrote: "He certainly had a sister Florence and I understand that she had a child out of wedlock, reputedly fathered by the local squire, for whom she worked. 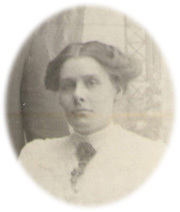 Both Lizzie Louisa and Harry worked at Scawby Hall too. I think that they met there.4"
[S2] GRO Indexes to Births "1884/Q4 Edmonton 3a 315." [S300] Copy birth certificate of Flora Jane Euridge (October 11, 1884). [S2] GRO Indexes to Births "1884/Q4 EURIDGE, Flora Jane Edmonton 3a 315." [S185] E-mail from Tessa Hunt to Teresa Pask dated 8 August 2002. [S1077] 1901 Census RG13 Piece 2655 Folio 4 Page 18. A scullerymaid (Domestic) to Richard Dyott, a Retired Lieut. General Colonel Army Officer. [S185] E-mail from Tessa Hunt to Teresa Pask dated 24 May 2002. [S3] GRO Indexes to Marriages "1906/Q3 ENRIDGE, Flora Belper 7b 1251." [S3] GRO Indexes to Marriages "1906/Q3 HUNT, William Belper 7b 1251." [S185] E-mail from Tessa Hunt to Teresa Pask dated 14 July 2006. [S301] Copy birth certificate of William Arthur Hunt (April 8, 1907). Kindly provided by Tessa Hunt. [S185] E-mail from Tessa Hunt to Teresa Pask dated 6 June 2002. [S2] GRO Indexes to Births "1907/Q2 HUNT, William Arthur Burton 6b 429." [S303] Copy marriage certificate of William Arthur Hunt and Olive Beatrice Isabella Marler (25 December 1930). Kindly provided by Tessa Hunt. [S2] GRO Indexes to Births "1887/Q3 EURIDGE, Charles Reuben Edmonton 3a 308." [S94] Soldiers Died in the Great War. [S3] GRO Indexes to Marriages "1909/Q3 EURIDGE, Charles Reuben = YEOMANS, Bertha Burton 6b 709." [S953] Website Commonwealth War Graves Commission (http://www.cwgc.org). [S375] Website GenesReunited (http://www.genesreunited.co.uk) Frances Whitehead, the daughter of Leigh Whitehead: 12 April 2007. [S468] E-mail from Jennifer Cotton to Teresa Pask dated 9 October 2003. [S2] GRO Indexes to Births "GRO Online Index: 1910/Q1 EURIDGE, Wilfred Charles YEOMANS Burton 6b 426." [S2] GRO Indexes to Births "GRO Online Index: 1912/Q1 EURIDGE, Kathleen YEOMANS Burton 6b 799." [S2] GRO Indexes to Births "GRO Online Index: 1915/Q3 EURIDGE, Nellie YEOMANS Burton 6b 697." 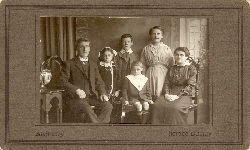 Research Note: Jennifer wrote: "Bertha was the youngest child of seven, her siblings were Jim, Jack, George, Fanny, Sarah & Lily (this is probably not the right order. )2"
[S1076] 1891 Census PRO Ref RG12 Piece 2205 Folio 65 Page 38. [S2] GRO Indexes to Births "1889/Q1 YEOMANS, Bertha Burton 6b 403." [S1077] 1901 Census PRO Ref RG13 Piece 2645 Folio 86 Page 33. [S3] GRO Indexes to Marriages "1917/Q3 Burton 6b 648." [S3] GRO Indexes to Marriages "1939/Q3 TWIGG, Bertha WHEATLEY Derby 7b 2309." [S2] GRO Indexes to Births "1889/Q3 EURIDGE, Alfred Victor Burton 6b 415." [S4] GRO Indexes to Deaths "1890/Q4 EURIDGE, Alfred Victor Burton 6b 251 age 1." [S954] Website Deceased Online (www.deceasedonline.com) Euridqe, Alfred Victor Buried: 10 Dec 1890 Stapenhill Cemetery, Staffordshire. [S1056] Website Find My Past - 1939 Register (http://search.findmypast.co.uk/) RG101 5925I 021. [S3] GRO Indexes to Marriages "1936/Q4 EURIDGE, Wilfred Charles = DIXON, Ruby May Ash by Z. 7a 294." [S71] Copies of Wills and Letters of Administration held (information available upon request) "EURIDGE Wilfred Charles of The Earl of Lichfield Arms, Conduit Street, Lichfield Died 8 August 1965 at Victoria Hospital Litchfield Administration Birmingham 13 December to Ruby May EURIDGE widow £2,625." [S4] GRO Indexes to Deaths "1965/Q3 EURIDGE, Wilfred Charles Lichfield 9b 58 age 55." [S8] Additional information available upon request. [S3] GRO Indexes to Marriages "1936/Q4 Ash by Z. 7a 294." [S2] GRO Indexes to Births "1917/Q1 DIXON, Ruby M. KIRK Ashby Z. 7a 136." [S4] GRO Indexes to Deaths "1976/Q1 EURIDGE, Ruby May 23 Jan 1917 Lichfield 30 1003." [S1056] Website Find My Past - 1939 Register (http://search.findmypast.co.uk/) RG101 5925I 021 (Incorrectly transcribed as 23 June 1917). [S71] Copies of Wills and Letters of Administration held (information available upon request) "EURIDGE Ruby May of 160 Netherstowe Lane Lichfield Died 16 March 1976 Administration Birmingham 3 August £15,642." [S11] Index to Wills, 1860 to 1989, EURIDGE Ruby May of 160 Netherstowe Lane Lichfield Died 16 March 1976 Administration Birmingham 3 August £15,642. [S4] GRO Indexes to Deaths "1985/Mar PEPLOW, Kathleen 19 December 1911 East Staffordshire 30 835 385." [S3] GRO Indexes to Marriages "1937/Q4 EURIDGE, Kathleen = PEPLOW, William E.G. Burton 6b 887." [S4] GRO Indexes to Deaths "1990/Feb LAKIN, Nellie 9 June 1915 East Staffordshire 30 703 290." [S3] GRO Indexes to Marriages "1939/Q4 EURIDGE, Nellie = LAKIN, Joseph C. Burton 6b 1293." [S468] E-mail from Jennifer Cotton to Teresa Pask dated 10 October 2003. [S954] Website Deceased Online (www.deceasedonline.com) Euridge, Peggy Anne Buried: 26 Apr 1937 Stapenhill Cemetery, Staffordshire. [S2] GRO Indexes to Births "1931/Q4 EURIDGE, Peggy A. EURIDGE Burton 6b 511." [S4] GRO Indexes to Deaths "1937/Q2 EURIDGE, Peggy A. Burton 6b 383 age 5." [S2] GRO Indexes to Births "1902/Q2 EURIDGE, Elizabeth Emma Burton 6b 455." [S3] GRO Indexes to Marriages "1926/4 EURIDGE, Elizabeth Emma = HAYNES, Harry Burton 6b 741." [S146] Personal memories of Teresa Pask née Euridge. [S4] GRO Indexes to Deaths "1997/Feb HAYNES, Elizabeth Emma 10 Apr 1902 East Staffordshire 7311B B23D 055." [S1056] Website Find My Past - 1939 Register (http://search.findmypast.co.uk/) RG101 5235E 008. [S4] GRO Indexes to Deaths "1975/Q1 HAYNES, Harry 12 Jun 1900 East Staffs 30 0683."